438 people want to do this. 7 people have done this. Actually make a list of all those books. Books owned on and before 27 November 2015. 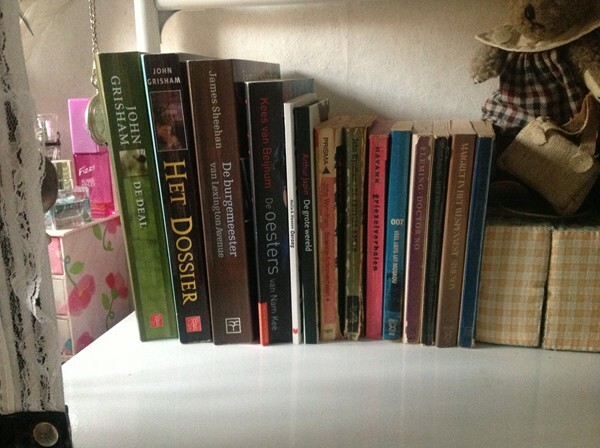 Perchance these are all in Dutch, some I bought myself, but most of these 14 books have been from my parents -as you can see by the age of the spine of some of them. And yes, these are just 14 of the ±75 books I listed below. When I was younger, I used to be a major librophile, but I kinda lost the devotion lately. Still, I can't resist buying second hand books so I have a whole pile of books which I haven't read. I will change this. 18/2 started with Sandra Brouwn - Kourova clona. Have now read High Fidelity, but also need to read Pride and Prejudice, Oranges Are Not The Only Fruit, and Interpretor of Maladies.